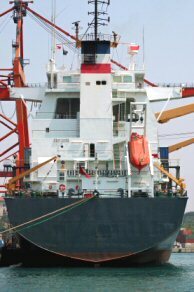 Ship maintenance management software, like vehicle fleet maintenance software, is similar to any other CMMS or computerized facilities management system. It may also include a condition monitoring system to assist the engineers to stay on top of potential problems before they develop. In some ways ship's maintenance is more suited to an enterprise asset management system, where the whole enterprise must be controlled. Typically this could include control of everything that takes place on the ship with all functions fully integrated. It could even include navigation aids and calculations. Modern communication systems means that it is just about possible for a ship to remain permanently connected to a shore based maritime maintenance management system. Work continues on these systems that use a combination of Satellite, Terrestrial and WiFi communication methods. These improvement in ship to shore communication make the use of web based ship maintenance systems not only feasible but possibly advisable for maintaining the plant, systems and equipment on board. It also facilitates the use of shore based ship maintenance systems on central servers that can be accessed by a fleet of ships.